Although Horizon is a floating platform, its unique design allows it to rest almost completely motionless, even in very rough seas. (See Figure 9) Just how this is accomplished is a part of the patent. Even though there are hundreds of floats (point absorbers) within the platform, there is only one generator, one mooring line and one electrical cable, thereby reducing costs. Because of this and the fact that it's a floating platform, it doesn't need to be located near the shoreline. It can be placed further out to sea or wherever mean wave energies are greatest. Horizon was specifically designed to be effective in a broad range of sea states. As such, it is not dependant on any wave length. 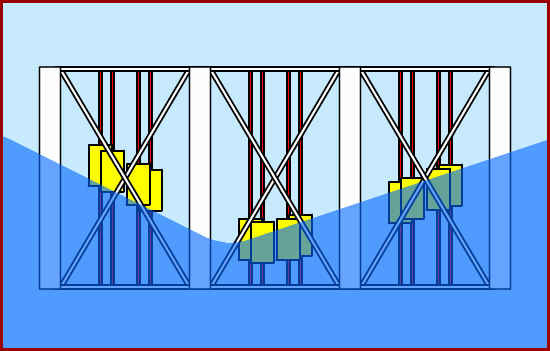 The structure of the Horizon platform is extremely strong and rigid. This gives it the unique ability to not only weather hurricanes, but operate at peak efficiency during them. The seemingly fixed nature of the Horizon platform offers great efficiency (ability to extract energy from waves). Overall, Horizon ranks high on the comparative efficiency scale.